My bed is a wreck. 2 days of lemsip enabled battling with my bed sheets before I regained post-flu levels of physical and mental calm. Without Sampo’s sturdy and steadfast body to weigh down the bedding it’s much more likely to find the floor, the walls, the ceiling, the staircase….. The 6 earrings that I never remove were neatly paired and placed on my bedside table. Apparently, in the middle of the storm I decided to remove and place them in an ordered sensible fashion. I don’t recall doing this, or have insight into why I would do this. Were the studs weighing me down during some essential battle with some imagined foe of my fever? They’re back in place now. One of the breakfast rituals that has evolved at mum and dad’s home is loading-up their daily pill portions to ensure they take the right pills at the right times and can be confident that they haven’t misremembered taking them. This is dad’s personal container after it’s been loaded. 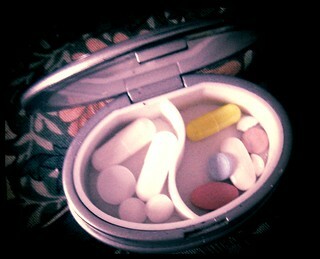 He knows what each pill is for, what it’s called and has a system for the pill-case division. He proudly talks me through it’s contents while mum chips in occasionally with a cheerful ‘I take that one too“. They go on to compare their different pill regimes for me, why mum takes aspirin to thin her blood while dad takes warfarin, pronounced by dad as “wool for in”. They’re like a couple of kiddies comparing toy collections. I smile and tease them about the drug names. The size and mix of drugs in this daily dose to keep an 80 year old on track for longer life surprised me. My physiotherapist pointed out that moving my elbow to complete some of the physio excersizes was actually “cheating”. I’ve since noticed that I’ve developed a whole range of little movement cheats to compensate for a slightly rigid wrist. 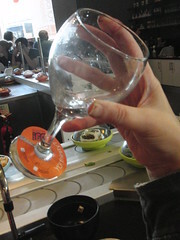 For example, notice how the upper line of the thumb and back of the hand (from the wrist) hasn’t moved in these two photographs – yet the tilt of the glass has changed. 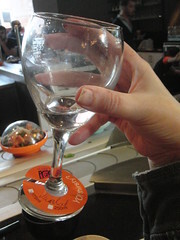 I can mimic gintly tilting a stemmed wine glass by moving it with my little pinkie. Can you see the offending digit in action? Joseph Huntley and his son Thomas opened a biscuit shop at 72 London street, Reading, in 1822. As Quakers, the Huntleys believed in honesty, self-discipline and hard work. They used high quality ingredients and sold their cakes and biscuits at a fair price – passing on savings to the customer rather than accumulating unnecessary wealth. I like their approach. 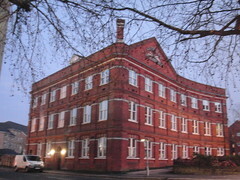 In 1846 the firm purchased a factory on Kings Road for £1,800. 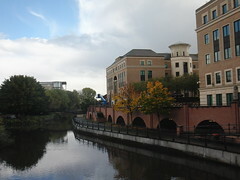 The factory was positioned on an island site between the River Kennet and the Kennet and Avon canal. It had a floor space of 5,000 square feet and was spread over an area of half an acre. The Island is currently the home of the Prudential’s headquarters. From 1855 Saturday evening entertainments were held to keep people out of the public houses. A Mutual Improvement Society was started and all employees over 16 could use the library on payment of 1d per week. Weekly lectures were also organised during the winter months. By 1860 Huntly and Palmers employed 500 staff who produced 3,200 tons of biscuits per year. In 1861 the average weekly wage was 16s 9d for men and 8s 8d for women and girls. By 1894 this had risen to 20s 1d for men and 9s 3d for women and girls. In July 1855 they arranged a boat Thames trips for about 200 employess and families to Park Place near Henley. In 1857 the firms first outing was organised when the employees went by special train to Crystal Palace. From then on every alternate year an excursion took place, until 1868 the sheer number of 3,000 employees made factory excursions impossible. In 1898 the Recreation Club was founded by George Palmer who had bought 49 acres of land (now Palmers Park) to provide sports facilities. The company provided all the equipment for cricket, football, hockey, quoits, bowls, tennis and athletics. Employees who had completed over 50 years service received a non-contributory pension. By the early twentieth century a pension fund had been set up but only men were allowed to join. 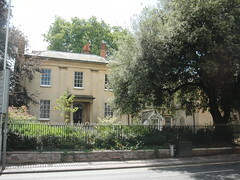 In 1906 George Palmer’s son, Alfred, presented the college with the site in London Road which included The Acacias, his fathers former home. This became the University Library. The decline of the companies fortunes can be aligned with many changing environmental and social conditions and coincided with the changing moral values of the family owners from Quaker to Anglican. The link may not be causal… I’d like to know more about the decline. In 1975 the factory provided the location for the bar scenes in the Hollywood movie ‘Bugsy Malone’ with Jodie Foster and Scott Baio. The UK provides “Statutory Sick Pay” SSP to provide people who are temporarily unemployed (up to 28 weeks per annum) due to ill health with an income – becuase employers are not required to pay them while they are ill. Small and medium sized businesses cannot afford to give thier employees the benefit of normal pay during illness. The standard weekly rate for SSP is £85.85 a week. Try living on that! My weekly living costs, even without work related travel are substantially more than £85.85 per week. 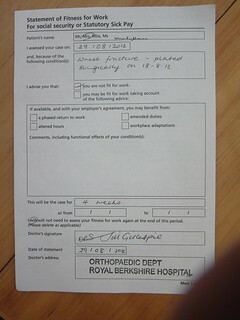 My sick note is for 4 weeks off work from the date of the operation, 5 weeks after the accident. If I took that time I would have to live-off my savings. I started working again before my savings were touched. 18 days after surgery Jess walked me through my exercise regime – to be repeated once an hour for 15 minutes. That’s intense, almost no room to do anything else! Lie forearm on a table. Keep the elbow still and roll forearm left then right as far as it will go. Move thumb across the palm then away from the palm – as far as it will go. Move each finger back as far as it will go and hold for 20 seconds. Move hand from wrist – backwards and forwards, side to side, as far as it will go. Massage the skin around he scar with a good moisturizer to encourage healing and blood flow. me: Hello, my name is Wendy House. On Wednesday 29th August during my appointment at the fracture clinic the Dr told me that I would have my first physiotherapy session next week, which is this week. The receptionist told me that I would recive a letter with the appointment time – I haven’t recived a letter and I’d like to check what time my appointment is. I’ll forward you to the [name] department. They shouldn’t tell you to phone us. me: They didn’t. They said I’d get a letter, and I haven’t so I decided to phone you. They shouldn’t have said that – we don’t send out letters. You’re not on my system. Hang on while I look at these files. Oh! 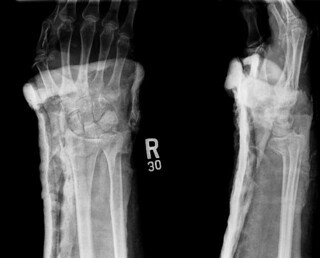 you’re right on the top with a note to phone you and make a direct appointment – broken arm. It will take some time to enter all this data but I can make the appointment now. Will 11.40 on Thursday suit you? me: Yes. Do I go to the same place as before? The fracture clinic on Floor 2.
me: So I’ll walk in the main entrance and ask reception to point me to physiotherapy? No! They could send you anywhere. Are you driving? 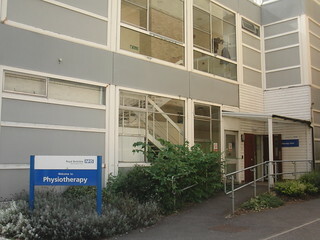 10 days since the operation, with my arm in a cast, I returned to the Fracture Clinic for my first follow-up appointment. 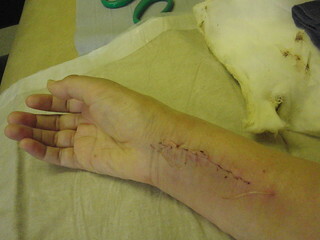 The statuesque painted blonde nurse admires the neatness of my scar and stitches as she removes the cast. The petite naturelle orthopeadic physiotherapist also compliments the neat scar that’s healing well. Is that all you can move it? It hurts quite a lot…. The physiotherapist demonstrated a regime of daily exercises. Our schedule involves weekly physio check-up sessions and an overall progress check in mid October. After explaining this she just stood up and left the room. I sat there in silence for a while, It was a wierd segue. Was this the end of the session? Was she coming back? Was someone-else coming in? Should I leave now? The statuesque painted blonde nurse wandered in and gave me a ‘sick note’ for my employer – so they can claim my Statutary Sick Pay. Do I leave now? Will the appointment times be sent to me? The young receptionist was flustered. She couldn’t work out how to book my Physio appointments. I was the 3rd patient this afternoon that had asked them to arrange this type of appointment…. 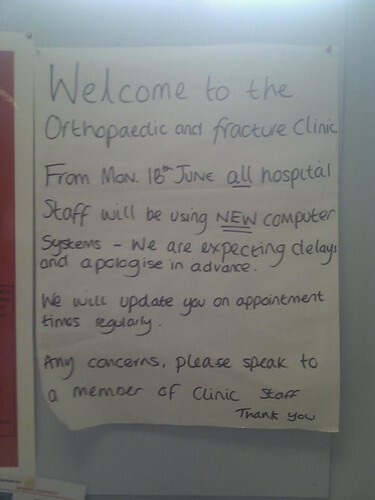 I used to work at this hospital, there’s a 2 week waiting list for a physio appointment, you wont get one next week! Do YOU work at the hospital? No. I’m just a patient. The blonde nurse sent me here when I asked if the appointments would be sent to me. She smiled, her wonderfully humble and respectful way added a little joy to this otherwise dour place. I wasn’t stable – I could hardly stand up! there is noone at home to look after me for the critical 24hrs after the surgery. She told me that I had misunderstood. Naughty me misunderstanding while I’m drugged-up. She wasn’t sending me home right now. I asked her to leave me alone, which thankfully she did. Then I climbed out of bed, opened the curtains to my neighbouring patients who were all real sweeties gently teasing me about this and that. The stout nurse bought over 2 of those ‘operation gowns’ – knee-length, short-sleave baggy jackets with small ties. She asked me to wear one with the ties at the back and one over the top with the ties at the front. Where are your ID tags? She wandered off and returned with 2 plastic strips showing my name and date of birth, attached one around my good wrist and the other on my ankle. Strange dresses and plastic wristbands? Just like going to a festival! We’re walking to the operation Theatre? Should I wear my sandals? Stout nurse grabbed my arm and used this, unnecessary, technique to steer me down the corridor towards the Ward’s reception desk. At the reception desk she confirmed the name and route to the operating Theatre. I didn’t take notes. As we walked the hospital corridors where other people were fully dressed stout nurse explained that she was an agency nurse so she didn’t know her way around this hospital. 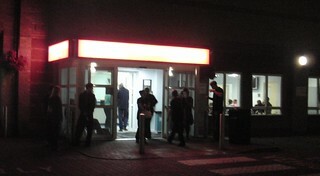 Stout agency nurse asked directions and we found the right set of swipe-card operated doubledoors. The nurse told me that she had meant to borrow a swipecard from the ward reception, but forgot. A flood of words burst through my tears about how disconcerting it was when you have to walk in a silly dress amongst fully clothed people, how scarey it is to have surgery, and how getting lost then being locked out of the operating theatre just adds to a general level of distress. She didn’t understand. 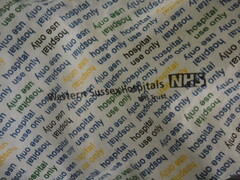 I put some effort into quelling the tears, wiping my face on the sleeve of the operating theatre gown. A lady’s face appeared in the round window of the secure doors. She wore green and a little hat. Her body-posture inspired confidence. The anesthetists assisstant greeted us. She looked me in the eye as she told me her name, her role and started explaining what was going to happen. I gave the agency nurse my sandals as I climbed onto the operating table. I told her about the times before that I’d had a general anasthetic and how I was scared of waking-up screaming in pain like my last operation. The last thing I remember before waking up was her reassurance that I wouldn’t wake-up screaming in pain…. After nearly 5hrs witing at the RBH fracture clinic a young lady wearing a white jacket and stethoscope tells me what’s going on. Hooray! There’s a hand and wrist specialist surgeon on duty covering Accident & Emergency over the weekend. Since the operation will be tricky they want a specialist to do it so they’re going to book me a bed in the Trauma ward for the weekend and the specialist will operate on me inbetween the accidents coming-in. So, hospital checkin on the 17th August after 7pm. Meanwhile, I provide Pre-op information to a nurse in another building. 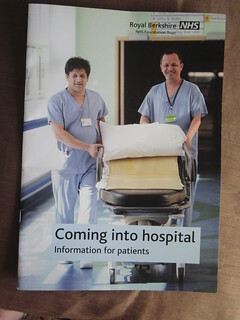 The nurse gives me a large glossie brochure about coming into hospital. After the X-Rays I retrurned to my normal status of main corridor fire hazard. A nurse came out from the back rooms, moved a child off a chair and sat me down in that chair. The consultant has seen your X-Ray’s, he thinks they are quite serious and you need an operation. He’s called our hand and wrist specialist who agrees. So please wait here. of the relief that RBH have actually considered my injury. a nurse has been nice to me – rather than treat me as an inconvenient object. 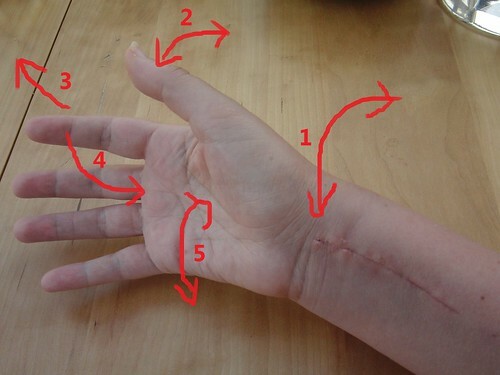 reaffirmation that my injury is quite serious – I’m scared of surgery. I’m developing a bad habit – cry way too easily. A nurse announces that the clinics for 2 specific doctors are running 90 minutes late and 2 hours late. I have no idea which Doctor I’m seeing, no paper appointment. Another nurse moves the people with fractures out of the main corridor to allow hospital traffic to pass. She explains to us that standing in the corridor is a fire risk. I’m the only person with a fractured arm, everyone ese has an injury to thier legs. Standing on crutches in the main hospital corridor. I grin at the man who has a mini plaster cast on his toe. He looks suitably embarressed. 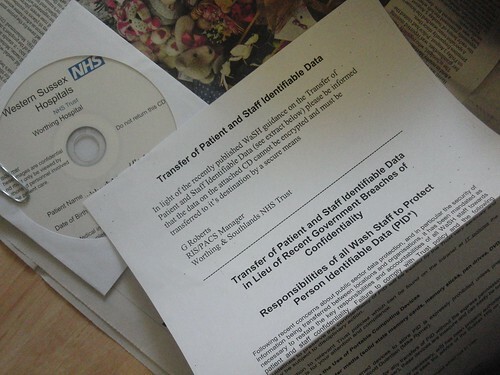 Worthing hosppital gave me a CD with my data on it. They told me this includes notes and X-Ray. 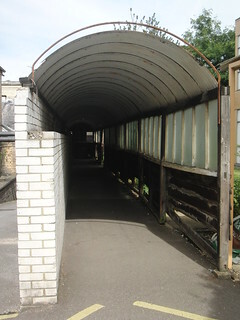 I was to carry this information to the Royal Berkshire Hospital (RBH) in Reading town. Apparantly, human hand delivery is more secure and reliable than using a cloud based system or encrypted email…. When you’ve got a broken arm everything takes longer and people are more able to offer help… an elderly gentleman helped me to carry my small bag onto a bus. Home with my cuddly kitty, fresh bed linen, and tea on tap. A wonderful sense of relief. Doctors are easiest to recognise because they mainly wear a stethoscope around their neck. None of the staff introduced themselves – no name, no role. They’ve done away with these useful basics. They occassionally use my name to call me out of the increasingly amorphous queue in the waiting area. Things changed slightly after my 6.30pm X-Rays. 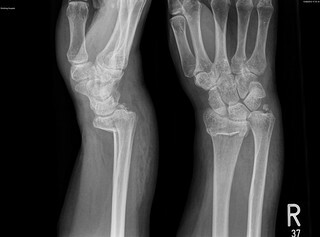 I became the “Smiths Fracture“. 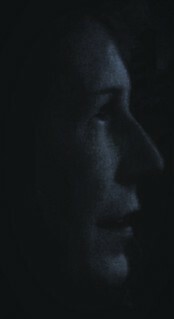 I could evesdrop on the staff talking amongst themselves about me- the fracture. Do people have to wait hours for ambulances? I felt a little bit guilty about an ambulance being called because I didn’t need any ambulance-fancy equipment or go-faster Sirens. I persuaded the young paramedic to take me to Worthing A&E, less that 5 minutes drive away, even without sirens. Standing-room only in the waiting room, good job the curb hadn’t attacked my legs! Facebook confirmed that my relatives are not shy about liking that I have broken my arm despite the clear social convention to avoid liking such things. The Brit’s normally start thier comments with an empathetic variation on “Ouch!” and the USA people go straight in with the positive get well wishes. 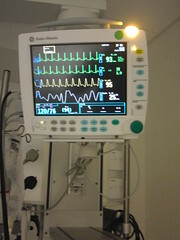 Morphine didn’t kill the pain, Morphine meant I no longer cared about the pain. The paramedic talked about his early career as we waited for the ambulace. He looked all of 25 years old. His early career had been in London. The people weren’t polite, he’d started to ‘burn out’ and get ‘cynical’. 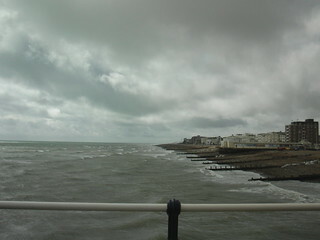 Here, on the south coast, people are polite and friendly. As if on cue, an old man from a nearby house offered us tea and biscuits. Riding along, following my instructor, I drove too fast into a bend and ended up punching the curb. Not a good move. A conscientious paramedic was on the scene within 10 minutes followed by 2 police cars because this was a Road Traffic Accident (RTA). The police apologised for breathalising me. I was being way too sensible to be drunk. Not even a hint of last night’s glass of wine was hanging around. I used to enjoy the long distance bus rides when I was a student. A National treasure, so cheap and comfortable and everything the Divine Comedy says…. I must find an excuse to use them again.